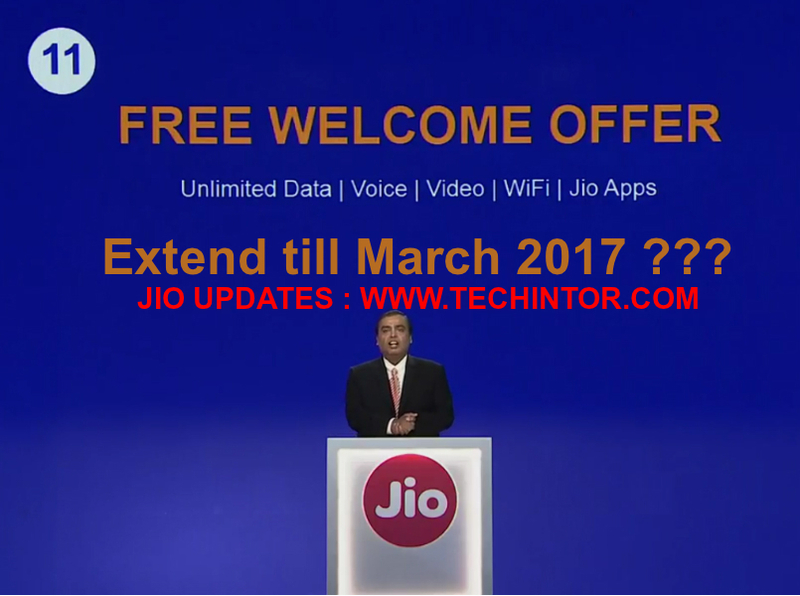 UPDATE [HOT NEWS ON JIO WELCOME OFFER VALIDITY]: JIO WELCOME OFFER MAY EXTEND TILL MARCH 2017. [ unlimited 4G Data + unlimited Voice calling and SMS till march 2017].READ THE FULL NEWS BELOW. Hi folks, In this article we will provide all latest news and updates of reliance jio. We update this article time to time with latest reliance news. Jio is the latest Indian cellular network which is a subsidiary of Reliance. Jio is full of surprises. They launched first with a ‘preview offer’ which was free unlimited 4g + free unlimited calling and sms for 3 months. but the jio preview offer was limited to some specific devices. later September 2016 they launched a offer caller welcome offer, by this all 4g devices owners are able to take jio sim. Means jio were available for all users [4g users]. and the welcome offer was ‘ unlimited 4g internet data + unlimited calling and sms till dec 31st 2016. All preview offer users were automatically converted to welcome offer on 5th september, except LYF smartphone owners. For LYF smartphone users jio extends preview offer [unlimited 4g+calling+sms] to 1 year. yeah it was full of surprises. day by day the number of jio users hugely increased in India. All other Indian network operators were lost much users. After september 5, any 4g user can get a jio sim free with welcome offer. it means all 4g users can get unlimited 4g + unlimited voice calling and sms with jio sim. Jio also announced their tariff plans which will start rolling after dec 31st 2016. But friends, this is not the things now. they are changed many things. there are lots of changes in jio welcome offer and other jio terms and conditions. continue reading this article and get latest news about jio , jio welcome offer status and jio 4g speed. There are some chances to extend the validity of JIO welcome offer to March 2017. Jio getting a huge response from users from all over India so jio may extend the welcome offer validity to march 2017. Because they want to complete their target of 100 Million customers. There are some news rolling on social media and some analyst also stating that ‘ jio may increase jio welcome offer validity to march 2017′. here is the report from livemint about jio welcome offer extend till march 2017 news. If so then users get unlimited 4g data [with 4gb speed limit] + unlimited voice calling and sms till march 2017. Since Jio is full of surprises chance of this news is very high.Note: there is no any official updates from jio till now. The chances is 50 50 now. On jio myjio app and on other official sites , the welcome offer is december 31st and no any clues of march 2017. May this extending news lasts as rumour. anyway we can wait for the updates. Customers whose are buying jio sim after december 3rd will not get jio welcome offer. there is a rule exist in India, that a network provider allowed only 3 months to run a promotional campaign. Due to the force from other telecom networks to TRAI, Jio welcome offer may ends on 3rd december. But this not news also not actually confirmed. the fight between jio and other network on this topic is still going on. The date 3rd december is only for new jio users. whose are looking to buy a jio sim, we suggest you to buy before december 3rd. But all customers who are currently in welcome offer will be able to use welcome offer till offer ends [ the validity still unknown. may march 2017 or dec 31st 2016]. I think all of you remember the first month jio 4g speed. It was around 50-70 Mbps, yeah which was the highest 4g speed available in India. But the things are changed now. Due to very huge response and the unlimited 4g offer the jio speed decreased very much. TRAI recently reported that Jio is the slowest 4g provider in India. Obviously it’s because the welcome offer. Airtel ranks first in 4g speed. now use jionet and jiodata APN alternatively. It means sometimes jionet gives you very high-speed , sometimes jiodata provies very good speed. so try both apns. and use APN which provides good speed at that time. Still slow speed on jio 4g, then tryout some more tricks to increase jio 4g speed. Jio grabbed more than 15 Million subscribers in India after september 5th. In just 26 days, jio got 15 million around customers, jio is the first telecom network which got 10million + subscribers within short time. Go to above link and fill your details. The jio officials come to your home and collect proofs and bar code. That’s it. This way you can jio sim free online. Also please note that, there many online scams running on online free jio sim service. these all are fake. there is no any separate portals or website available for jio online booking. >> please make sure that you are using https://www.jio.com/apple URL while booking jio sim online. this is the only official site from jio. Today Reliance jio announced their new offer called ‘ Jio Welcome Offer‘ which is something like their old preview offer. This new jio welcome offer is applicable for all 4g users. Unlike their old preview offer, The new jio welcome offer has no any restrictions or it’s not limited to some specific brands. The jio users can enjoy unlimited 4g till 2017 . The welcome offer starts from September 5, thus all 4g handset owners can buy a reliance jio sim with ‘welcome offer’. so all jio users can able to enjoy unlimited 4g till 31st December 2016. If you have a 4g smartphone, that is enough now to get a jio sim with ‘welcome offer’. There is no any limitations to some specific brands. AS per the welcome offer, all jio users can enjoy free calling and free 4g internet till 31st december. This awesome, really an unbelievable offer from reliance jio. AS like from the beginning, Jio continuing in providing awesome offers to users. 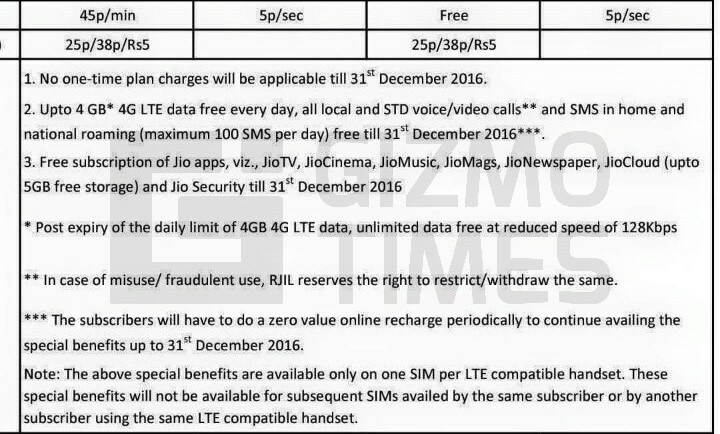 Reliance jio also announced their tariff plans and data plans which applicable from 2017 January. The tariff plans include free calling offer and world cheapest data packs. Guys, This is the best time to enjoy free internet and free calling, so read this article and get know more about reliance jio ‘welcome offer’. ** Jio ‘welcome offer’ start from 5th September and available for all 4g handsets. The offer applicable for everyone till 31st December. ** Jio offers also Free calling and Free SMS till 31st December. ** The users need to do a zero rupees recharge through online to update the welcome offer each month. Yeah, it’s a zero rs recharge, no need to pay a single cent. 1) I am already a jio user and i am currently using ‘jio preview offer’. Is this welcome offer applicable for me? Ans: Yes, From 5th September all previous users will be automatically converted to ‘jio welcome offer’. It means, the preview offer gonna end.and after 5th September, there will be only welcome offer exists. You ca enjoy welcome offer till 31st december. that is you can enjoy free 4g, calling and sms [as per welcome offer] till 31st december. 2) What is the tariff plans of jio in this period? Yeah that’s all about reliance jio ‘welcome offer’. I am sure that this gonna change the Indian telecom network. The other Indian telecom networks like Idea and Airtel already lost millions of users, and now this new jio welcome offer and world cheapest tariff plans of jio really effect other telecom networks. WE can hope some effective moves from airtel and idea to save their existing customers. Yeah, Jio effect everywhere. many more about reliance jio is coming, stay tuned with techintor.com and get updated. Brother I got sim today and it is not activated I think it will activate after 5 sept.. So I got preview offer or welcome offer pls tell me..? Behn chod bina barcode sim chahiye. Teri behn bina paisa mujhe chodne dogi to mein tujhe bina barcode sim dunga mother chod. Sir ane wale gio offer me 3g handset me jio use kar sakte hai kya please inform me. plz sir change apka new offer par day 1gb..us ka sath 1 gb or bhara dho plz sir.